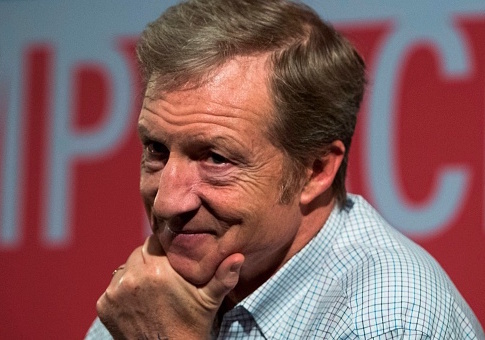 Liberal billionaire Tom Steyer, who has been pushing for President Donald Trump's impeachment and recently spent $3 million to register Latino voters, also is working hard this week to resuscitate a California state bill that would end the process of demanding thousands of dollars in cash bail from suspected criminals. NextGen America, Steyer's flagship environmental advocacy firm and political action committee, has paid to sponsor Politico's California "Playbook" morning newsletter of top headlines every day this week. Steyer is using the California Playbook sponsorship to promote a special Sacramento screening of 13th, a documentary film on racism in the criminal justice system. The title of the film is a reference to the 13th Amendment, which freed slaves and prohibited slavery. At the screening, Steyer will also participate in a panel of criminal justice reform experts that will discuss how "we can fix California's broken money bail system," according to the message running each day in the California Playbook. "Join NextGen America, Tom Steyer and a panel of criminal justice reform experts to discuss how we can fix California's broken bail system, and for a special screening of '13th,' the documentary by Ava DuVernay on racism in the criminal justice system," the California Playbook message reads. NextGen America did not respond to an inquiry about whether the organization or Steyer personally funded the documentary. A bill to overhaul the bail system in California has stalled in the Assembly after being approved in the Senate. It faces stiff opposition from industry lobbyists and lawmakers who are worried that it will impose high costs on counties. The measure is aimed at trying to ensure that accused criminals awaiting trial do not remain in jail solely because they cannot afford to pay bail. The proposals would end the practice of requiring criminal defendants from having to pose money as a condition of release from jail and would instead require counties to set up pre-trial services agencies to consider whether defendants pose a harm to the community or are okay to release. California Gov. Jerry Brown has concerns about the costs such an overhaul would place on countries. Attorney General Xavier Becerra has supported the bail system overhaul, arguing earlier this year that "bail decisions should be based on danger to the public, not dollars in your pocket." Keeping defendants locked up because they can't pay the amounts judges set for pre-trial releases "entrenches people in a cycle of poverty" and allows wealthier defendants accused of crimes to operate freely before their trials. This entry was posted in Politics and tagged California, Tom Steyer. Bookmark the permalink.